Giveaway of $10 gift card! In a world where suddenly nothing on a computer is safe, Liam Benedict, the wunderkind of proprietary software, is setting the world on fire with his ability to design software that will work only for one program on one system. It’s a boon for both corporations and benedict, because the software is broken apart and reconfigured each time a client begins a new project. Benedict says it also can protect financial information at banks, financial management firms, any entity where privacy and secrecy are more important than anything else. He has a team of trained, trustworthy experts who write code and create programs that are virtually impenetrable. His explosion of success has come to the attention of Arroyo, a multinational conglomerate run by billionaire Taylor Cantrell and her husband, Noah. They were recently here in Tampa to seal the deal to make SBD a part of Arroyo. This reporter tried to arrange an interview with them but was told everything goes through their public relations department on San Antonio, Texas. We did, however, learn that the company is moving to larger, more secure quarters even as you read this. There is also a rumor that Benedict’s newest client is a defense contractor who may or may not be designing a super secret project fr the Department of Defense. I’ll be doing my best to keep you updated. Is there a romance brewing or is the tech world’s newest wunderkind in some kind of trouble? High profile, much-in-demand criminal defense attorney Sydney Alfiore was spotted having drinks with Liam Benedict, owner of Software By Design. Benedict is much in demand because of his firm’s ability to design software that is project specific. Defense contractors are lining up to hire him. Rumor has it he has a new client who needs the best firewall in the world for a super hush-hush project. Alfiore, meanwhile, is smack in the middle of a very high profile murder trial, where it’s said her client may be on the verge of convicted. Don’t believe it. Alfiore always pulls a rabbit out of the hat at the last minute. The media has been covering the trial on a daily basis and every television station wants five minutes of her time. So how did these two people find the time to meet for a drink? And look very cozy doing it? For Liam Benedict, the merging of Software by Design into the Arroyo mega-conglomerate is a dream come true—until someone on his staff screws with critical software and puts the company and its future in grave jeopardy. Suddenly life is not so euphoric for Liam. His contract with a defense contractor is in jeopardy, he doesn’t know who to trust on his staff and there is a distinct possibility a foreign power is behind the whole thing. When forensic data analyst Eric Braun discovers who it is and how they did it, he is killed before he can tell Liam who the mole is. Framed by the killer, Liam is arrested for murder. It will take the combined resources of beautiful criminal defense attorney Sydney Alfiore, the woman he, loves, and the huge Arroyo Corporation to solve the riddle, but can they do it in time? Whoa, this sounds exciting! Would check it up on the e-retailers! This looks like a great read, thanks for the chance! This one sounds great!! Thanks for the great giveaway. I really like the sound of this book! Thanks for sharing! 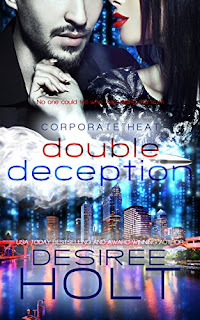 DOUBLE DECEPTION sounds like an exciting read. This book was awesome! Thank you for letting me read an ARC of it. Love your books. Looking forward to reading this one. Great excerpt. Sounds like something I'd love to read!